(¸.·´ (¸.·´ .·´ ¸¸.·¨ `*~*~* ART AUCTION TIME! Welcome! I’m really excited to let you know about the artwork up for grabs today. 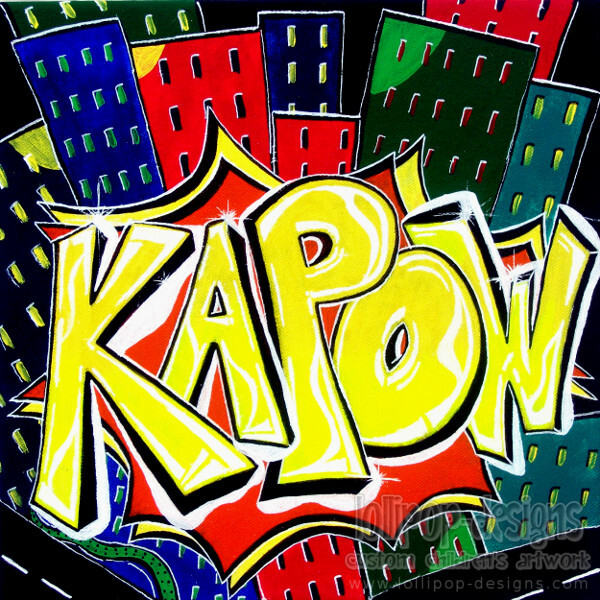 The item that is now open for bids is a large size Graffiti / Street Art style Poster with the word KAPOW on it. It is a proper photographic print of my original artwork. The poster is printed on archival quality paper (ie. inks are guaranteed for 30 years no fading). This is your chance to bid on a piece of art than will add vibrant color and atmosphere to any room it adorns. This print comes ready for you to frame or laminate it. It will be carefully rolled up inside a sturdy cardboard tube and posted anywhere in the world. If you do not wish to wait for the Auction to finish and would like to order one of these colorful posters in a different size, just message me for details. If you have any questions at all regarding the Auction, just message me. PS. I am in Melbourne, Australia and my timezone is +10 hours, so if I am delayed in getting back to you, please don’t worry, it may be because it’s the middle of the night in my timezone etc. I will get back to you as soon as my email is checked first thing in the morning. To bid, simply add your bid in the comments section on facebook. (¸.·´ (¸.·´ .·´ ¸¸.·¨ `*~*~* Happy Bidding and Good Luck! This entry was posted on September 2, 2013 at 10:43 pm and is filed under Art with tags art auction, graffiti, original artwork, street art. You can follow any responses to this entry through the RSS 2.0 feed. You can leave a response, or trackback from your own site. ART AUCTION now FINISHED – A big congrats to Suzanne Block who is the winning bidder.